You are currently browsing the category archive for the ‘Portland Photographer’ category. The grind and hustle of daily news photojournalism is no joke. Some people can be a bit sniffy about news photographers. Screw them. As much as possible I try to ignore the haters and the artificial boundaries they construct in the photoworld. True, my interests primarily lie in documentary, participatory, vernacular and some fine art photography, but in every interaction with photographers I want to explore and understand the contexts in which they make work. Therefore, it was a pleasure – for the latest Eye On PDX feature – to chat with Thomas Boyd. The lifestyle and work-style of news photographers has always intrigued me. Unfortunately, often my discussions of news photography begins with iconic or controversial images, images’ subtexts and imagery’s distribution in our larger ad-fed visual culture; rarely do I get to ask nuts-and-bolts questions to the individuals who create the widely-circulated images we see daily. An avowed Oregonian, Boyd is a news shooter through-and-through. He is a staffer with The Oregonian, the state’s biggest paper and as such has important insights into journalism (past, present and future). Here, Boyd talks frankly about his experience with the paper; what makes a good image; the peers he admires; and the rise of the amateur. Prison Photography (PP): How long have you been in Portland? How long have you been with the Oregonian? What’s the deal with this town? Thomas Boyd (TB): I came up from Eugene five years ago, but before that I lived in the Portland area for about 10-years. I grew up in North Bend on the Oregon Coast and Portland has always been a special place for me. I find it endlessly fascinating. PP: Day to day, what do you shoot? TB: I shoot assignments! I shoot between one and three assignments a day and I never know what they’re going to be until the night before or even an hour before. Yesterday, I shot a basketball game in Eugene, today, I shot a portrait of a documentary filmmaker and an overweight police horse. Tomorrow, I’ll shoot a cat show. That’s a typical random week. I also shoot a lot of Duck football, Portland Timbers and track and field. PP: I understand the photo staff has shrunk at The Oregonian in recent years? Tell us about the changes at the the newspaper. TB: Like all newspapers, the business is eroding. With that came layoffs three years ago and buyouts before that. We now have three less photo editors and the staff is down to 10 with two part timers from 19 full timers five years ago. They hire very few freelancers. However, in a recent meeting the we heard the paper met it’s financial goals for 2012 and merit pay raises may be possible. The paper is making money. But, even with these changes, the way I work really hasn’t changed. I pitch story ideas and I shoot assignments. I actually see more change with the organizations I cover. I’m seeing them keeping us out of situations so they can document it themselves and drive traffic to their own websites. I’m seeing this with all types of organizations from non-profits to professional/college sports teams. We are essentially competing with the organizations we cover. Reporters are also being asked to do more with photos, video and social media. I’ve found myself competing with them on stories as well. It’s really awkward for the people we cover. They don’t readily understand what our roles are. The amount of bloggers covering events is big change too. If you look at the amount of journalists just covering the Timbers, you’ll see that newspapers and television stations are drastically outnumbered. It’s really strange to me. As far as I can tell, none of them are making any real money. If there are two dozen photographers on the field, maybe only four of us are actually getting paid. They do it because they are fans and have day jobs. It’s a head-scratcher for me. PP: Do you make images outside of work? TB: I shoot outside of work quite a bit. I take as much commercial and editorial freelance as I can, shoot a few weddings here and there, and pick away at my personal projects. PP: Do you have time to follow the news, blogs, discussions online, or are you too busy being a producer and filing stories? TB: I wouldn’t say I’m too busy because I somehow find the time…but I don’t follow all that stuff as much as I used to. I probably spend as much time online reading about motorcycles and home remodeling as I spend reading about photography. I also write for a blog called ApertureExpert.com. PP: Does a lot of the gas-bagging (I’m being self-referential there) online affect the daily life and work of photojournalists? If so, how? TB: Good question. I suppose photojournalists are influenced by influential work. We see a trend and try to emulate that or be inspired by it to some degree. I’m probably more influenced and more interested in talk about the photography business than actual shooting. As far as my daily work, I’ve become pretty good at sticking to my approach and not preconceiving a situation. It took me a long time to get to that point. When I first started I was all over the map stylistically and how I approached a story. I’m much more methodical and disciplined now, but I do still like to try new things and experiment. PP: How do you define a successful day/shoot/assignment/image? What brings the smiles at the end of a day? TB: The only thing that makes me happy at the end of the day is walking away with a photo I like. And, that is a rare thing. Starting out I was more into the experience of making the photo. The results were not as important to me, probably because I couldn’t differentiate between an above average image and a great one. Don’t get me wrong, I enjoy great experiences on assignment and that happens all the time, but making a great image is where it’s at. I will forget all the suffering I experienced, if I end up with something worth looking at. I really love the rare times when I’m in the creative zone and everything falls into place. I have an idea, the circumstances are ideal, and I get lucky. The thing about photojournalism is, you never really know if what you are doing will work until it’s too late to do anything about it. It’s all about anticipating what will happen instead executing a plan. If what you are striving to create is spontaneous, real and in the moment, there’s a huge amount of luck involved. It’s all about putting your self in a situation to that favors luck. I’d compare it to hitting a home run or a hole in one. The more you do it, the luckier you get. PP: Are photo editors important? TB: Good photo editors are important in that they can take great work and make it better. Mediocre photo editors get in the way of good work. I rarely sit with an editor and have them go through my work. I mostly work remotely. I’ll send in my top picks and they take it from there. I seek out advice on projects, but I believe photo editing is as important and creative as shooting. For that reason, I like to do it myself. I like the idea that I have more authorship in the final product. We make online photo galleries for the web and that’s really what I’m shooting for these days. PP: How do you characterize the photo scene in Portland? TB: By my estimation, there are way too many of us. Worse yet, there are too many mediocre photographers that manage to get work by under-cutting better ones. I suspect they won’t last much longer than their trust fund, but that can’t be too soon. That sounds harsh, but I’ve stood in the rental line at Pro Photo and watched a Craigslist wedding photographer rent $400 worth of gear to shoot a $800 wedding. That’s happening in all sectors of photography on different scales. On the other end of the spectrum, there are some great, highly accomplished Portland photographers that deserve everything they get. Dan Root, Lars Topelmann, Steve Bloch, Sol Neelman, Chris Hornbecker, Bruce Ely, Jamie Francis, Brian Lee, Leah Nash, Chris Onstott, Thomas Patterson, Jonathan Ferrey, Ray Gordon, Anthony Georgis, Craig Mitchelldyer, Andy Batt, and many more that inspire me with solid, professional work. PP: What lies in the future for you? TB: If I could have my way, I’d retire at The Oregonian doing what I’m doing now. I’m a newspaper shooter and have been since I started stringing for the AP and The Oregonian while I was still in college at Portland State in the late eighties. I’m a home grown Oregonian and I don’t want to live anywhere else. I’m hardwired to shoot newspaper assignments and I love it. The future probably won’t turn out the way I want. If it doesn’t, I see myself launching a successful freelance career, starting a business and riding motorcycles. PP: Anything else you like to add? TB: For the first time in my career, I’m worried for the future of the photography business. There are just so many forces out there driving down the value of photography and there doesn’t seem to be a bottom. At the same time, there are so many people wanting to do it and schools are cranking out more and more photographers. I’ve always believed that with desire, hard work, a bit of talent, and a little help, a person could make a go of it. I’m not so sure anymore. I wouldn’t advise anyone to do it now. The internet has created a huge demand for photography, but it hasn’t translated into more work and money for photographers. The challenge is to avoid thinking about all the negative stuff, and keeping my level of creative energy up. At the end of day, I’m really grateful that I’ve been able to do it this long. Click images for full 2000-pixel wide view. Kirk Jones is, like many, a photographer with a wandering path. Jones has worked with newspapers, assisted at a large commercial studios, and custom printed Pulitzer Prize winning photographer David Hume Kennerly‘s photographs. Between 1994 and 1999, Jones freelanced in South East Asia, mainly in Vietnam and Cambodia. Upon returning to the U.S., he concentrated on web design and now manipulates Gigapixel imagery as a Senior Computer Scientist at Adobe. Three years ago, he made a return as a practicing photographer. “I have slowly been easing myself back into the photographic world,” says Jones. His independent work has been published on CNN.com and NYTimes.com, his images featured in a documentary on Jesse Bernstein. He exhibits locally. 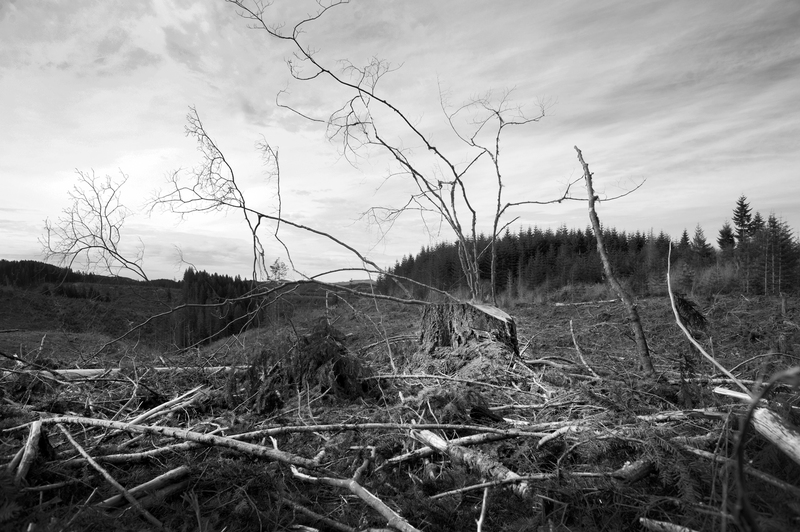 Over the past year, Jones has photographed clearcut logging, the urban growth boundaries that exists near Portland, OR, and the migrant work force that caters to the Oregon wine industry. 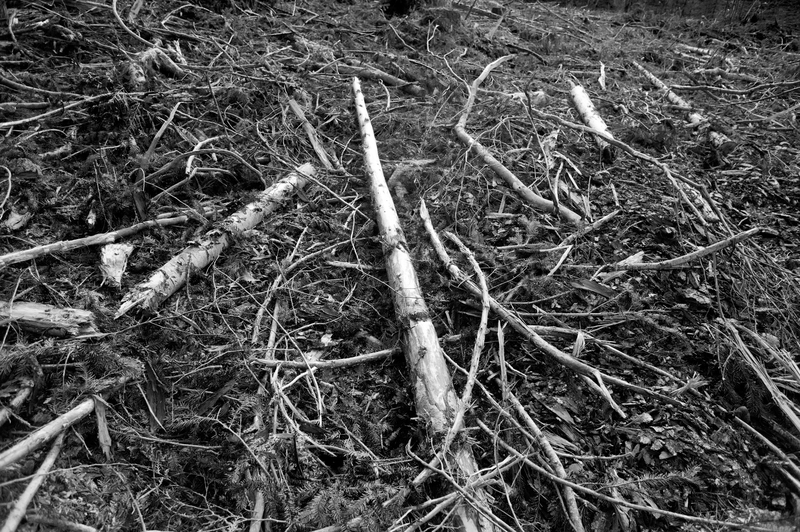 Black & White images from Jones’ Clearcut series and colour images from his Farm To Table series. Prison Photography (PP): You’ve photographed a lot of different places, but I picked these because they were recent, close to our city of Portland and about economics, industry, nature, and the region’s culture. 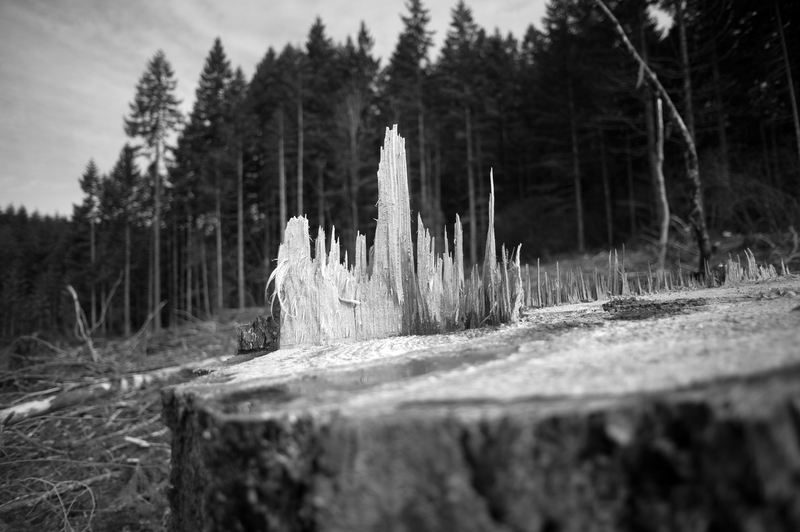 Why the interest in clearcut logging? 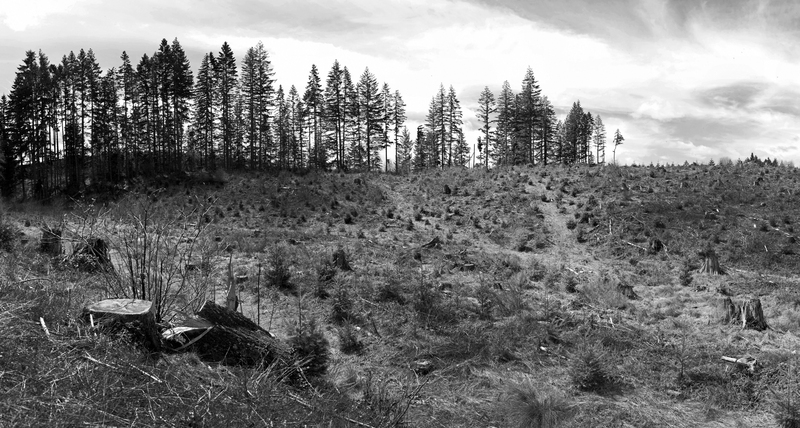 Kirk Jones (KJ): Witnessing the clearcuts along the Western Oregon highways recently, I experienced the same emotions as it did when I was young and gazing from the car window. Most of us that live here, and those that visit, at some point witness these open landscapes – often behind the veil of trees left standing along the roadside. Photography is a medium to express what I observe happening close to home. Logging is an multi-faceted issue and something that contributes to our economy here in Oregon. I have a long history of considering nature and my place within it. I grew up in the Midwest and lived in Northern Minnesota until my junior year of high school. The area is known for lakes and forests and natural beauty, but it is also an area known for timber and for massive strip mining. Attending college at Evergreen in Olympia, WA – around the time of the spotted owl movement – sparked my affinity with the environment. Evergreen College was, and remains, a magnet for environmentalists and environmental theory. I recall during trips to the coast that the lumber companies left a thick row of trees along the highway to mask the reality of what was going on behind; I felt like they were trying to hide something. PP: This work is in the legacy of Robert Adams, Eirik Johnson, Christopher Lamarca and many others who look at the Pacific Northwest landscape with wry, open eyes. How should we be relating to our natural resources, in life and in photography? KJ: Without a connection to your natural surroundings it is difficult to connect to feelings of being alive. We are fortunate to live not only in an area of amazing natural beauty, but in a country that (hopefully) will continue to pursue the protection and respect for nature. It’s a fight. I’m not advocating that natural resources shouldn’t be consumed around us, but I believe there are right ways to do this and wrong ways. I don’t think strip mining and clear cutting are responsible short or long term. If photography can help illustrate, change or illuminate crisis, then I have faith that imagery can be a catalyst for crisis management. PP: How do you characterize the Portland photography scene? KJ: It has been quite a while since I was more entrenched in the photo scene. During the early 1990’s I worked at a large commercial studio in Portland as well as at The Film Lab located on the NW Park (gone now). At that time there was a lot going on and you could feel Portland growing. I traveled and worked abroad before returning to the region a few years ago so I am just now reconnecting with photography in Portland. I’ve gone to strobist shoots, stay active on a few mailing lists for local photographers, and test equipment for the teams at Gigapan. I look at local work when I can. The Portland photography scene appears to be healthy and there are a ton of cool things happening. I’ve been working on individual projects over the last few years and look forward to connecting with others. Eye On PDX is spreading its wings. It’s not migrating and flying the coop, but rather subdividing itself and doubling the product. From beside a fire pit last month, I asked Blake Andrews if he wanted join the meandering inquiry into photographers here in Portland, OR. Blake hopped on board. The fact Blake lives in Eugene, two hours south, does not effect his credentials. He’s up here every other week to shoot, talk and gallery-hop. Besides, he knows everyone here that needs to be known; he lived in Portland years ago before it was post-Cool. Eye On PDX is an ongoing series of profiles that feature a brief interview with a PDX photographer accompanied by a handful of photos. Blake’s profile of Douglas Lowell expands Eye on PDX to B. And Blake is delivering awesome content that I simple can not. “Has a photograph ever made you cry?” Blake asks Doug. C’mon! Awesome. Doug and Blake’s to-and-fro is lively and considered – the photobook as poetry and the importance of ideas over place. Read the full interview with Doug Lowell. One point of clarification. When Blake says, “Pete will handle all of the photographers who are imprisoned felons and I will handle the rest,” he is having a lark. Any photographers I interview who work in Portland and happen to be felons will not be imprisoned. “The world does not yet know the importance of Missy Prince’s photography,” is a tweet I sent out last month with a link to her Flickr account. Missy has only been making images earnestly for 4 or 5 years, but she’s loyal to film, has nailed down an aesthetic and (though she probably won’t acknowledge it) has nurtured an admiring photo-public. Like most Portland photographers, I first met Missy at a Lightleak meeting. She wears cowboy boots and straight, straight blonde hair. No fuss. I don’t know what she drives but looking at Missy’s photographs you’d reckon it a Vanagon, Lincoln Towncar or a veggie-oil bus. Her wheels have to be fun as she gets out into landscape often. Now, I’m not one to romanticise Portland or the Pacific NW, but if you are looking for a photographer who can capture the allure of the outdoors in a modest, meaningful and evergreen way then Missy’s the one. So verdant are many of her photographs, she could be a one-woman tourist-board for Oregon. Logging roads, trucker hats and fields of wildflowers; it’s the misty, damp images of the PacNW, Missy is known for but I wanted to feature some of her new stuff. These four photos are from West Las Vegas which, remarkably, is just a stones throw from the strip. Historically it is a Black neighbourhood. It has been largely overlooked during Vegas’ tumorous, gilded growth and accommodates its fair share of the social problems that go along with economic marginalisation. But in these images of sun-bleached streets there is the same appeal that exists in her work from Cascadia. Missy plays with time. Part of it is due to the texture of film, but part of it is her attention to the vernacular and the overlooked. Missy celebrates Americana; she does not patronise it. And, how does she always find that classic car? Her photographs gently point out what is all around us, if we can be bothered to get out the front door. Not idealised views, not scenes intended to manipulate, just straight up, well-composed vignettes. She treats photography like an exploration and you too might encounter within it moments of discovery. You check out her other interviews with American Elegy, Orange Juice and The Great Leap Sideways. I only had one question for her. The photo scene in Portland is pretty vibrant. There are a lot of photographers here. There are also a lot of galleries, publishers, and events, and there are thankfully still public black and white and color darkrooms. It’s a very photography friendly city, maybe partly because it is surrounded by land that begs to be photographed. I’m probably not a very good judge of the overall scene. What largely attracts me to photography is being out in the environment I am photographing, the meditative solitary experience. Taking photos is almost secondary. I could just as easily be out there sketching what I see. I’ve only been taking photos in earnest for a few years. A little over a year ago I was invited into a collective called Lightleak, which meets once a month to share work and talk about photography in a very relaxed atmosphere. It’s probably the deepest I’ve immersed myself in the scene. The great thing about those guys is they are all fellow film devotees who print their own work. As much as I enjoy the exchange with like minds, I have not deliberately sought many other photo-centered associations. I like when connections happen naturally. So far the internet has been my main resource for looking and sharing. I’ve actually become friends with a few local photographers whom I first encountered online. Perhaps that so many online roads seem to lead back to Portland is evidence of its enthusiasm for photography. Missy is a faithful Flickrer and has Tumblr is Sea Of Empties. You can buy prints here. Continuing Eye on PDX, my weekly series about Portland-based photographers, I speak with Lisa Gidley. Featured here are photographs from across her many portfolios. Prison Photography: How do you characterise the PDX photo scene? Lisa Gidley: I only know some of the people doing photography in Portland. I know the folks in the photo groups Lightleak and the Portland Grid Project. Even in these groups, we all have different aesthetics and approaches – analog/digital, B&W/color, portraits/other scenes. What we have got in common is that we usually capture recognizable pieces of the real world. Although I love lots of postmodern art, photography that’s been obviously Photoshopped isn’t my thing. I feel a pretty strong allegiance to the more realistic and unfiltered style of photography, and I’ve got excellent company in Lightleak and Grid. Plus, they’re all cool people and talented photographers who keep me on my toes. Our regular photo meetings motivate me to make some decent work each month, since I know they’ll all be bringing some terrific prints. It’s great to have a photo community that spurs you to keep shooting. Like sharks with cameras: shoot or die. PP: An Instax photograph of yours was featured atop Joerg Colberg’s recent piece The Single Photograph. You’ve been using this “Polaroid equivalent” for some time and I’ve witnessed the joy of Faulkner Short, Blake Andrews, yourself and others when using this instant-film camera. You’re involved with instaxgratification, a Tumblr of Instax photos by Blake, Faulkner, yourself and others. What’s with the Instax Camera craze? LG: I think the appeal is similar to that of genuine old Polaroids. Especially in this digital age, there’s a thrill to immediately having a cool little physical object that doesn’t exist anywhere else (at least until you scan it). Once you’ve taken a shot, that’s it: no cropping or color balancing or special effects added after the fact. That finality is nice. The prints are compelling to look at and to handle — they’re proportioned well and have a satisfying heft. Plus, the Fuji lenses are sharp, the color saturation’s good, and from what I can tell, the prints are fairly long-lasting. It’s a fun system. PP: Why do you make photos? LG: It’s a compulsion! I love looking at all sorts of photographs, and I love the challenge of trying to make photos I’d like to look at myself. With the type of photography I usually do — where I rove around different places and shoot whatever interesting scenes I come across — the main appeal is the thrill of the hunt. It’s fun to wander with a camera with no idea of what I’ll find, if anything. I typically shoot on film so it’s a few days of anticipation before I know if I’ve captured anything decent. Getting the developed film back is the best thing. After that, it’s also satisfying to make prints and share the images online and otherwise try to get my photos out into the world, but those activities are secondary to the process of shooting. I’m usually antsy to get back out again. There’s always something else to photograph.